Everyone is in love with these bracelets. Any of these beads would also fit on the chamilia, pandora, trollbead, etc bracelets unless noted. So you will have just a huge array of beads to put on your snake chain. 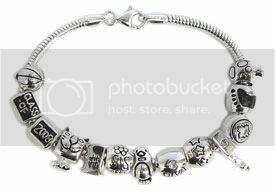 Such a fun new twist on the decades old tradition of a charm bracelet. These bead will fit all the popular european bead bracelets such as Pandora, Chamilia, Troll, Biagi, and more.